1. Put the freekeh blend in a saucepan with the bouillon powder and 500ml boiling water. Cook for 12 minutes, covered or until tender, adding more water if needed. Drain any excess liquid. Combine the honey and dressing in a small bowl. 2. Cut each chicken fillet into 3 and mix with the zhoug paste. Heat a frying pan and toast the pine nuts until golden. Remove. Heat half the oil in the pan and fry the chicken for 3 minutes each side, until cooked through with no pink meat. Remove. 3. Add the remaining oil to the pan and fry the courgettes for 6-8 minutes until golden. Stir in the freekeh and chopped mint. 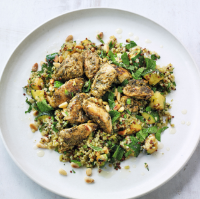 Serve topped with the chicken, pine nuts and chopped mint, and drizzled with the honey dressing. 1 of your 5 a day; low in saturated fat.